I’m fairly sure most stunt people are nice. When they aren’t doing their stunt work, I’m sure it would be cool to have a beer with them. I’m also fairly sure the Thai people are nice as well. So why the hell Panna Rittikrai hates them so much escapes me. He seems hell bent on sending every Thai stuntman to the hospital that he can. Maybe he has family members who are doctors or something. I can safely say that this has to be one of the most insane martial arts/stuntman film ever. Panna wanted to go next level ever since Ong Bak 2 and Born to Fight, and he has. You’ll be saying it every several seconds. It’s that insane. Panna aimed for the moon, and made it to Saturn at least. Hell, even Tony Jaa may look at this film and go ‘Hell, it’s a damn good thing I went nuts for a little bit. I want no part of that crap.’ The story is simple, pretty much nut-shelled in my synopsis above. The acting is terrible at the beginning, particularly that of Mr. Sinead, which may cause you to turn the film off, but don’t do it! After the kidnapping the film takes off at 100 miles an hour and doesn’t let up until the credits roll. The stunt work is simply astounding here, starting with the first one, a leap across a chasm by all of the main characters, who slam midair with the same number of baddies, and they all fall two stories down, with nothing but the concrete to meet them, and you see the fall and impact. Another piece of insanity involves a car running down about 20 good and bad guys in a warehouse, and what must be a record for crazy moments involves the final fight in the film, a duel between Pod and one of the main baddies under a moving big rig. Rittikrai captures all of this beautifully, as he places each camera so they can capture each stunt it all its glory, setting the maximum cringe factor to 10. What is even more impressive is the fact that he got these people to do this crazy stuff for him. I’ll give it up to Panna, he’s unafraid, and even has a part in the film as one of the bad guys, who also happens to be the one to dish out the most punishment to the stars. The fight scenes are also a great mix of choreography and stunts. The best fights are Pod versus a swordsman, and lo and behold there is a fight between what looks like two Choy Lay Fut fighters, in a fight that rivals anything seen in the dreadful Choy Lay Fut film that stung my eyes earlier this year. There is a good mix of styles, from Tae Kwon Do to Kung-Fu and Muay Thai. Bangkok Knockout is a crazy classic of a Thai film that shows off the Rittikrai’s stuntmen to make one of the most insane series of fights and stunts ever seen. Born to Fight was simply a warmup for the main event, and Panna Rittikrai and his stuntmen don’t disappoint. CHOREOGRAPHY: (9) The fights are well staged and complex, and all of the actors performed well. It’s very much in the style of most of Panna Rittikrai’s films, so it’s familiar, but still shows an evolution of that particular style. 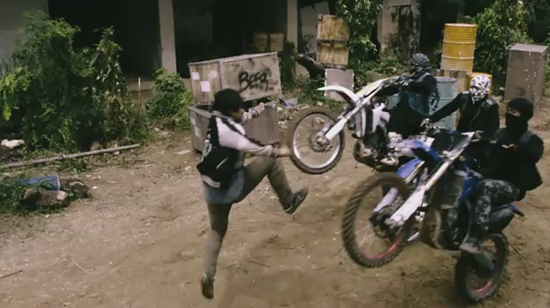 STUNTWORK: (10): The stunts here will be writ into legend, at least until Rittikrai’s next film. These guys were NOT paid enough for what they did. Not a chance. Simply amazing from beginning to end. STAR POWER: (6) The stars here are pretty much all unknown except for Kazu Patrick Tang, who starred as Jeeja Yanin’s lover in Raging Phoenix. Who knows? Remember that Tony Jaa got his start the same way as well. FINAL GRADE: (9) This is a really fun film that is as thrilling as it is cringe-inducing. What the Thai stuntmen and women are willing to put their bodies through boggles the mind. If you like fighting and stunts in equal measure, this is a must see. Kinda let me down when I found out the final fight between that Taekwon-do dude against Kazu wasn’t what I’ve been expected. But, for the whole action sequences are totally insane! Tell me, is this the first time Rittrikai shows himself as a bad guy? Coz he looks pretty badass here. He should take more role like this. Rittikrai did do the original Born to Fight movie, and starred in the Dan Chupong part. I know he also played a character in Dynamite Warrior, but I don’t think he’s played another baddie. I agree it would be cool to see him do it. Of all the bad guys he was the most formidable, and dangerous-looking despite his age.